Properties in Marrero average 4.7 out of 5 stars. Property 2: Classic Uptown Shotgun, just steps to the streetcar ! 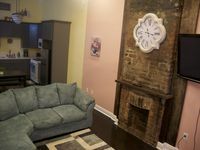 Property 5: Uptown Cottage 2/2 - Steps to St. Charles Ave.
Property 7: Irish Channel Home Only 10 Mins to French Quarter! Property 11: NEAR STREETCAR LINE! NEW LOCATION!! BOOK NOW! 5 minutes from FRENCH QUARTER! Property 13: Charming Creole Caribbean in Mid City! Property 14: 1839 Victorian Private Large Room Sleeps two Garden District. Property 20: Hop On The Streetcar ! Property 29: New Orleans Home w/Patio - 2 Mi to French Quarter! Property 34: Great Central Location For All Your NOLA Fun. Large 2 Bd Right Of Magazine St.
Property 46: Whole House- One Block To Frenchmen Street - With Courtyard! Property 50: Classic New Orleans home centrally located minutes to anywhere in the city!